Championships at Rose Bowl Stadium in Pasadena. 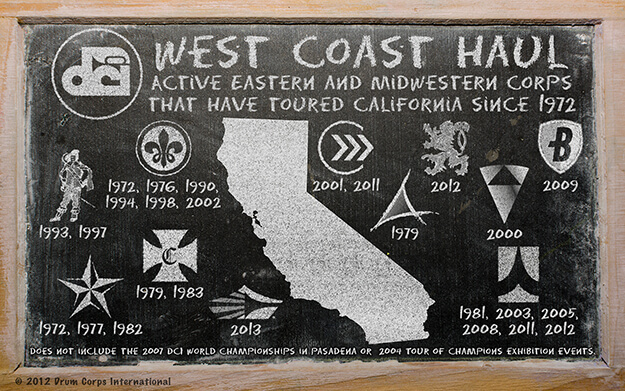 Carolina Crown will make an 11-day tour of the West Coast during the 2013 Drum Corps International Tour. After the DCI World Championships came to Pasadena in 2007, this will be just the second time in the Fort Mill, S.C. corps' history that it will perform and compete in the state of California. "We're looking forward to offering our members a change to our usual tour and giving our fans on the West Coast a chance to see us early," Carolina Crown Executive Director Jim Coates said. Crown will be the latest of a small handful of Eastern and Midwestern corps that have headed west on their annual summer tours in recent years. 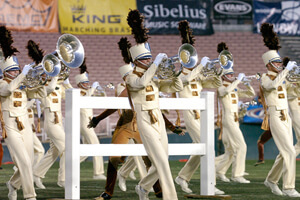 Phantom Regiment came to California in 2011 and 2012, the Cadets in 2011 and the Boston Crusaders in 2012. Unlike the Boston Crusaders who spent the entirety of their preseason in California last summer, Coates says Carolina Crown will hold its spring training in May and June with three weeks at Gardner-Webb University in Boiling Springs, N.C. The corps will make rehearsal stops in Tennessee, Arkansas, Oklahoma, New Mexico and Arizona to break up the nearly 2,500 mile trek across the country. The corps' first competition will be the third week of June in Arizona before spending 11 days in California. "It'll be exciting to go head-to-head with corps like the Blue Devils and Santa Clara Vanguard this early in the season," Coates said. It wasn't until a month into the 2012 DCI Tour that Carolina Crown faced either of those western foes. The group will start making its way back east the first week of July, with a stop at the annual Drums Along the Rockies competition in Denver. Coates added that he has tentative plans to give his corps members free time in San Francisco, San Diego and Las Vegas in between rehearsals and performances. A complete schedule of 2013 Drum Corps International Tour events will be released in November. Sign up for Drum Corps International's weekly DCI.now e-newsletter at DCI.org/fans to be among the first to know when the complete 2013 schedule is available.